I mentioned in my post of Apr 2 that I’m keeping a Zen Journal. 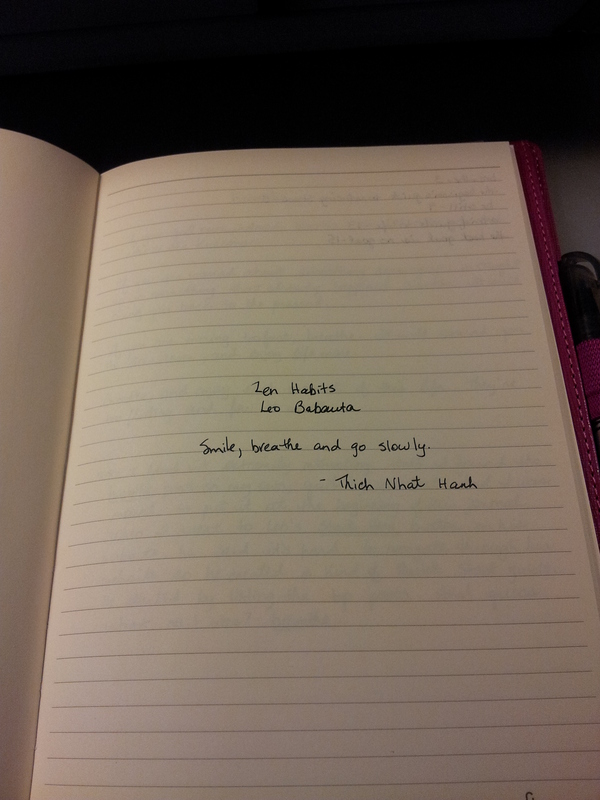 I was really moved by some of the posts on Leo Babauta’s Zen Habits site, and I wanted to copy them down. I’m really interested in stress relief and meditation at the moment. 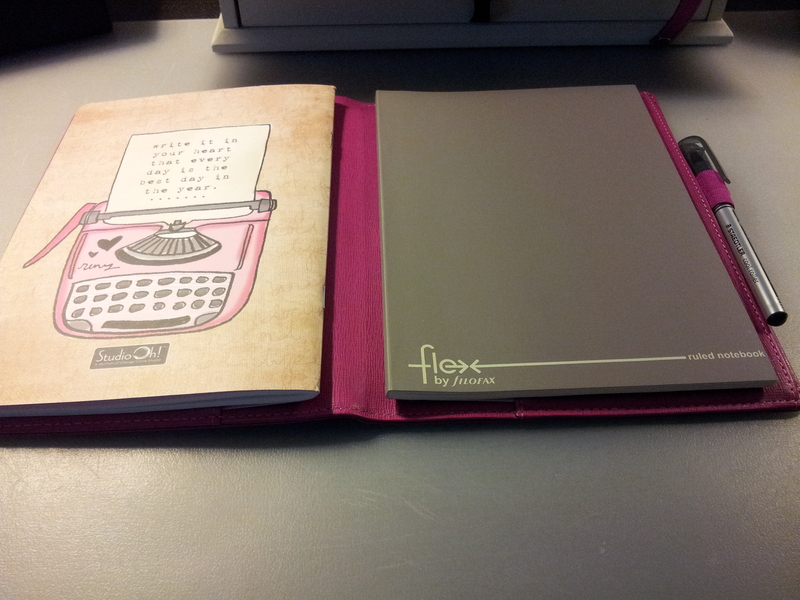 I chose my Filofax Flex notebook, the one Anna Brim sent me in her giveaway in February. I’m really enjoying the simple act of copying out the posts – it’s like nutrition for my mind. I’ve added the pink band to keep it together. 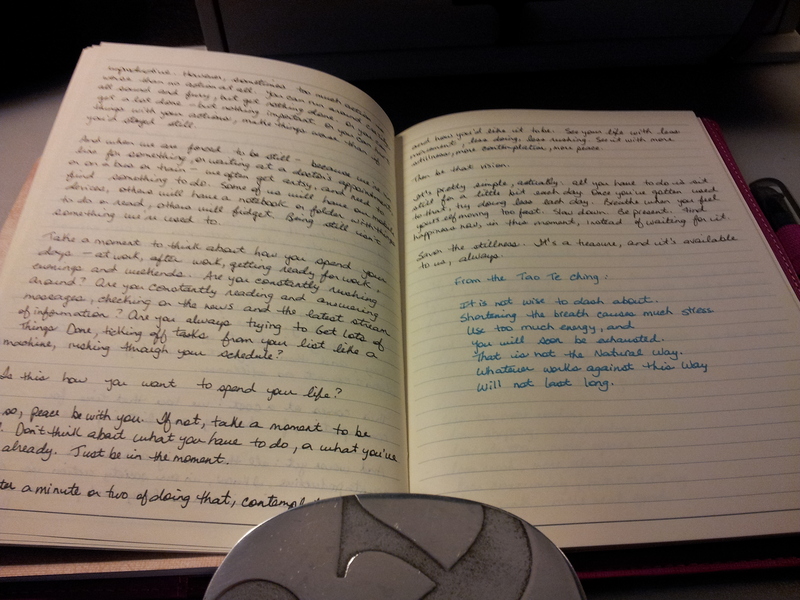 I’ve added an empty notebook to the other side of the Flex for balance, and for extra space for notes. Love that quote from Thich Nhat Hanh. I forgot (gasp!) to leave a few blank pages for a Table of Contents so I’m using the facing page to the first entry; hopefully I will have enough room. The green writing are my notes. I change the ink color every so often, to add some color. But I’m really liking the black ink on the cream paper. 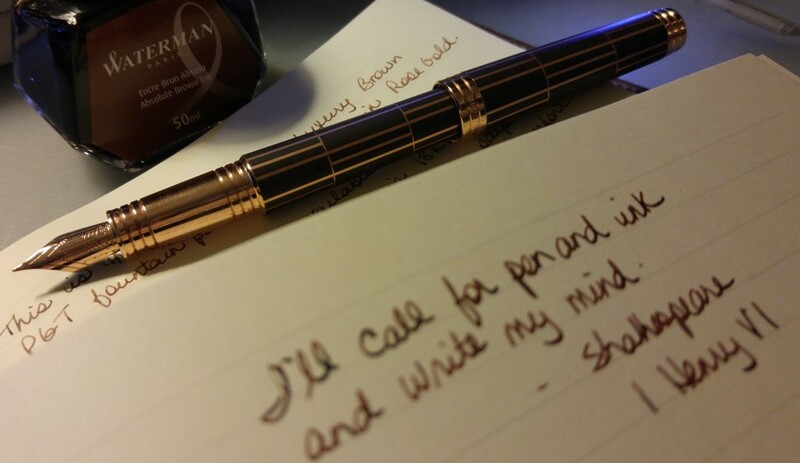 I’m using a Staedtler Cool Roller to write with. Thanks for the suggestion. I visited Zen Habits today. So lovingly simple. 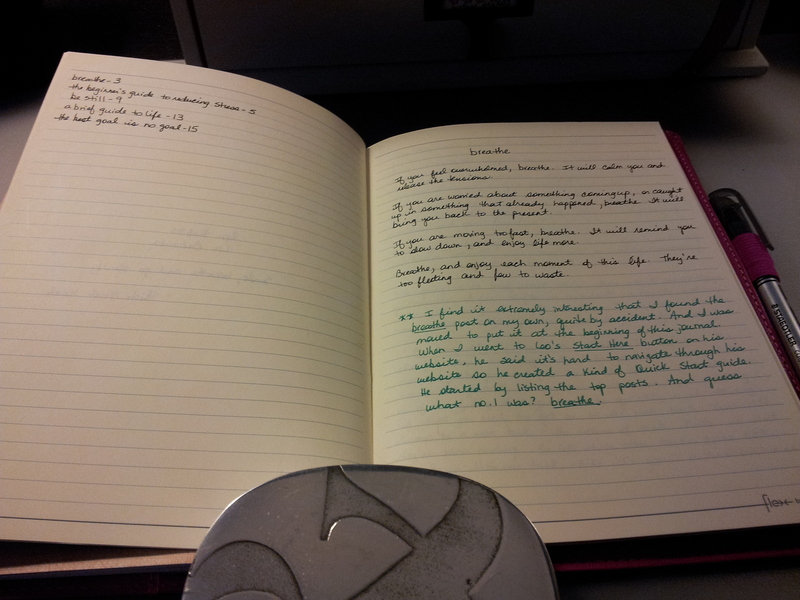 I want to encourage you with your journal. 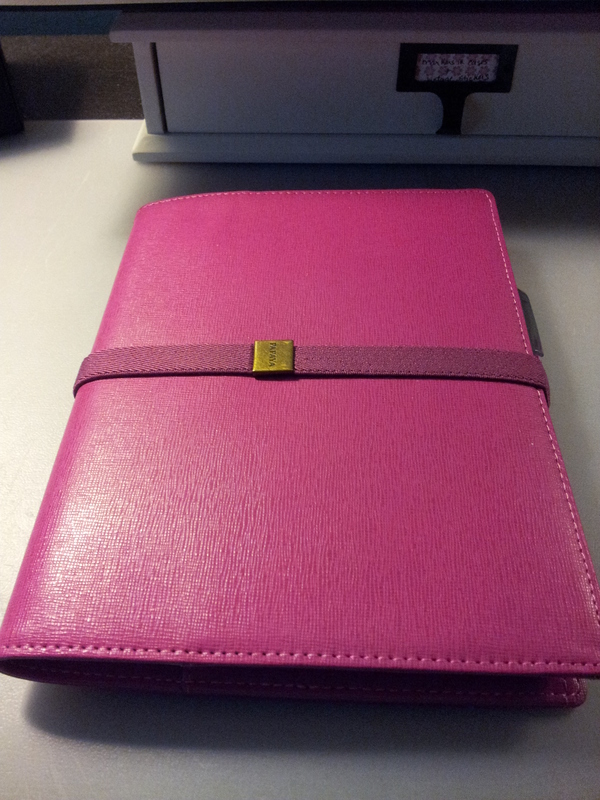 My own journaling is such an important part of meditation. The truths that come from between the lines astound me sometimes. A helpful book….Writing Down Your Soul by Janet Conner. Heather, have you read A Tale for the Time Being? If you feel some affinity with Zen, you might really like it. I went mad for it myself, but part of that was because I’ve lived in Japan and could recognise a lot of the places in the Tokyo sections. Hi Janet! I have not read it but it’s on my list now, thanks! What a great site you shared! I read today’s post and I am a major “worrier” and it is something I try to work on. I am trying to “be calm” and “relax” but I not easy for me. I love the idea of copying out messages. Awesome. Congrats on your win, it will be a precious journal for you. Thanks Winnie, I’m glad you enjoyed it. I’m a worrier too so that’s why I’m drawn to this site. I find by copying out passages from books or sites I retain them longer. My hand remembers thing when my brain doesn’t!